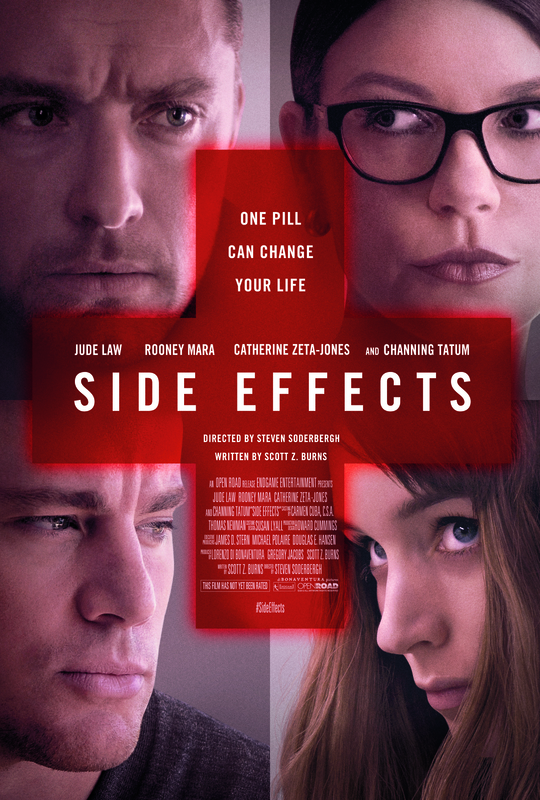 Although Behind The Candelabra didn’t get a theatrical release in the US but did in the UK, we revisit Steven SoderBergh’s second to last movie, Side Effects. Is it a bird, is it a plane? No, it’s a Steven Soderbergh thriller with more twists in it than dress-changes in Priscilla Queen of the Desert. Upod returns to the fray in quick time with a podcast dedicated to possibly the great man’s last ever directed film. If you believe the rumours that is. We at Upodcasting have a typically varied take on the Sod: he’s great, he’s OK, he’s overrated. That said, Side Effects does truly unite us and there ain’t that many movies that do that! So if this is to be Steve’s final cut, what has he left us with? It’s pretty much the Jude Law and Rooney Mara show from start to finish, with effective enough filler parts from Channing Tatum and Catherine Zeta-Jones. So whilst the pared down cast makes it seem relatively simple, there are so many twists and turns a red herring would get lost whilst looking for a wild goose. Thankfully, we navigate these and can say the film is really about: mental illness, “big” pharma, psychiatry, manipulation and revenge. Plus of course all of the moral – or otherwise – hazards that accompany such matters. It could be suggested that when you throw such a volumes of mud at something, then only some of it will stick. And whilst there are certain things that don’t quite ring true enough, the vast majority do and we’re left with a cracking good thriller with a hefty dollop of Hitchcock as things unfold. So Steven (Moby and Jim Rash have yet to be seen in the same room), if this is truly your last film as a director, then you’ve left us with a cracker and we’re grateful. And if not, then we just chalk this one up to being another on the long list of successes over your prolific 25+ year career. Steven Soderbergh’s been claiming that he will soon be retiring from film making, so it’s quite interesting to see the project that he wants to finish. One of which is the Behind the Candelabra based on the life of Vegas showstopper Liberace and his relationship with partner Scott Thorson. I’ve never really connect with Soderbergh’s work but he does always bring interesting people together on his projects and it has been a while since we saw Michael Douglas on screen after his health concerns. Based on the book by Scott Thorson who had a passionate 6 year relationship with Liberace, the movie is written by Richard LaGravenese (The Horse Whisperer, PS I Love, The Fisher King). Before Elvis, before Elton John, Madonna and Lady Gaga, there was LIBERACE – infamous pianist, outrageous entertainer and flamboyant star of stage and television. A name synonymous with showmanship and extravagance, he lit up every stage he performed on, as bright as his candelabras and with a unique flair that gained him millions of devoted fans across the globe. In the summer of 1977, handsome young stranger Scott Thorson walked into Liberace’s dressing room and, despite their age difference and seemingly different worlds, the two embarked on a secretive five-year love affair. To the outside world Scott was an employee, at most a friend, but behind closed doors his life with Liberace was an intense rollercoaster of hedonistic fun, flamboyance and excess. 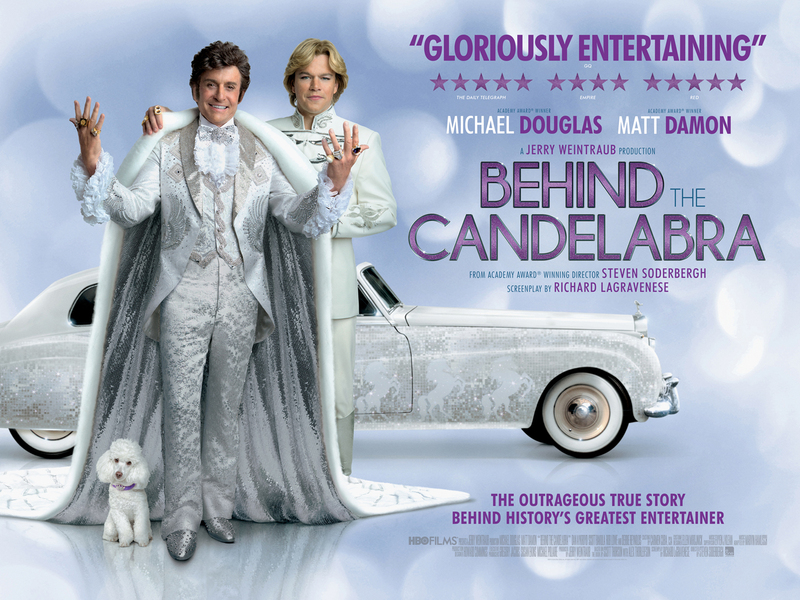 Starring Michael Douglas as Liberace and Matt Damon as Scott Thorson, BEHIND THE CANDELABRA tells the fascinating true story of their glamorous life together and their tempestuous relationship — from the glitz and glamour of the early days in Las Vegas to their very bitter and public break-up.